JXTC Adventure Club - an unusual travel pattern with gorgeous and elegant design, from the studio JoomlaXTC. Very practical and functional, and perfect for the theme of travel sites, blogs, online stores, and more. Supplied with JoomlaXTC XTC Framework, that allows you to have complete control over the template styles, and a correction of the pattern width and columns, backgrounds, color, and font sizes, layouts module positions and much more. 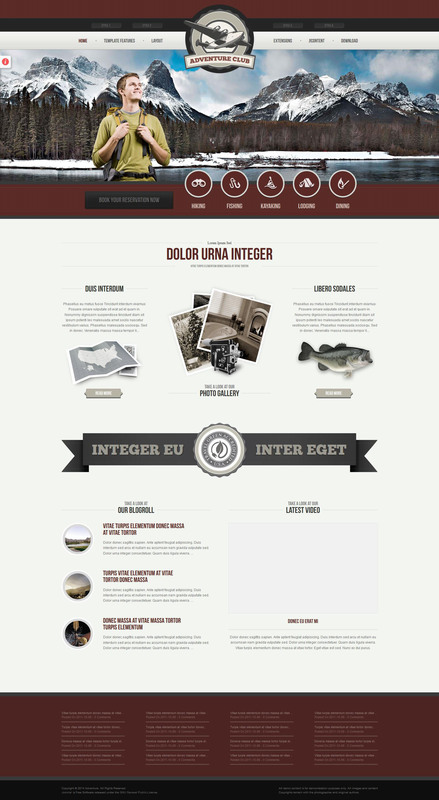 Has 4 preset style, flexible design, uses CSS3. The set includes the following extensions: Appointment Book Component, V-Tube Pro Component, Deluxe NewsPro Module, Image Wall Module, Modal Box Plugin.